Enjoy mineral spring water bathing in a relaxing and rejuvenating haven. The Retreat is an indoor/outdoor mineral water therapy zone with deck, guest lounge and open fireplace. Soak away stress and tiredness in mineral rich local spring water. 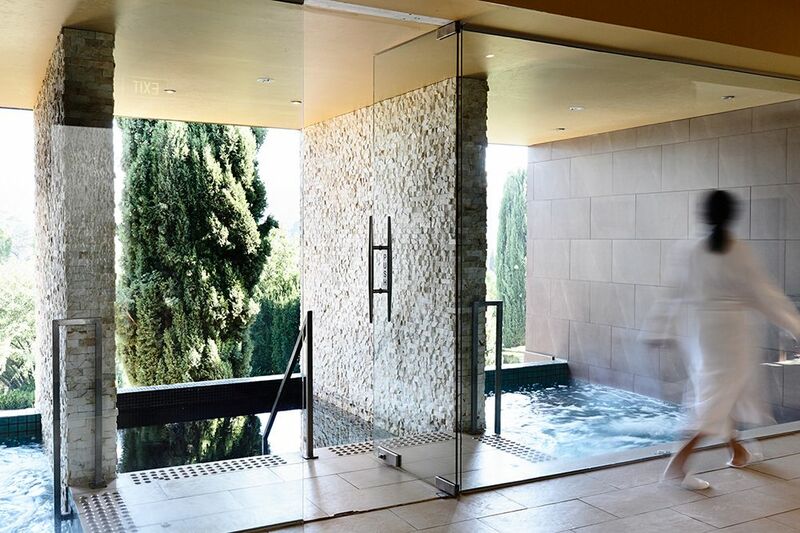 Two 38° mineral water spa pools revive and relax stressed bodies, while a cool plunge pool invigorates. The transition from hot to cool stimulates the circulatory system. The 80° stone sauna is piled with basalt rocks, producing a dry heat that reduces aches, improves circulation and releases tension. Step into the infrared detox box and be engulfed by gentle warmth that activates the body’s natural cleansing process. The wet steam room assists in opening the pores and clearing chest and sinus congestion. Enjoy time in The Retreat, moving between different elements for perfect relaxation. Ideal before a treatment, or an experience on its own. There are few things more relaxing than sinking into the healing warmth of mineral water in The Retreat in the evening. Every Friday and Saturday, 6pm – 9pm. Rise and shine! Start your day by spending an hour soaking in the warmth of mineral water in The Retreat. Take a look at our Retreat Packages to enhance your bathing experience. The steam room has many health benefits and works to relax the body and ease tension by flushing out and eliminating toxins. It also provides health benefits for people with respiratory problems such as asthma or sinusitis. By increasing blood circulation, the steam room can also reduce signs of aging and invigorates the skin to encourage a healthy, glowing appearance. However, the steam room is not for everyone. If you have a history of heart problems, acute rheumatoid arthritis, severe infection or are pregnant, we advise you first consult a physician. Indulge in the age-old ritual of sauna bathing in our dry stone sauna. Sit or recline on the cedar benches and feel muscle tension fall away as your body becomes acclimatised to the stable heat. Your pores will open, metabolic rate increase and your mind settle after a session in this sauna. Sprinkle lavender-infused water over the basalt stones and enjoy the therapeutic benefits of deep inhalation. Emerge after several minutes and head straight to the cool plunge pool to give your circulatory system and energy levels a boost. Two 38° degree mineral water spa pools revive and relax while the cooler plunge pool invigorates – all overlooking the garden. Our spring water is sourced from only the finest local springs and contains dissolved mineral salts, trace elements and gases vital for overall health and wellbeing. Unlike traditional saunas, the infrared Detox Box doesn’t use any steam, instead it emits infrared radiant heat. The infrared heat penetrates and cleans deep into pores, clears the organs of toxins and strengthens the immune system. It also removes the accumulation of potentially carcinogenic heavy metals as well as alcohol, nicotine, sodium and cholesterol.